Jewelry trees are very pretty when you hang all your favorite earrings, bracelets and necklaces from them, but your jewelry can become tarnished over time. I suggest using a jewelry box instead and then use anti-tarnish tabs or a piece of chalk if you think your room is humid. What should you look for in a jewelry box? 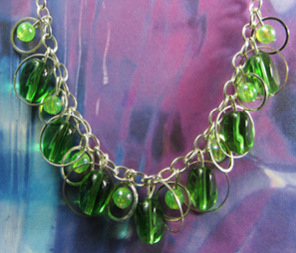 Think of your handmade jewelry as one-of-a-kind art you want to see and wear. A wooden case with glass doors placed on top of your dresser is perfect. Another option is several nice see-through glass or crystal containers with lids to hold all your charm bracelets, colorful necklaces and fun earrings. You’ll need easy access to your jewelry too. Don't put several vases in front of your jewelry box or jewelry containers thinking it looks pretty. You always have to be able to open the doors, or lift the lid and grab the earrings or bracelet you want quickly, because you bought your beautiful handmade jewelry so you would wear it. Shown on the right are two Hollywood Glam Flower Bracelets that have a striking vintage look, perfect for fashion stars making a dramatic entrance. These bracelets bring glamour back to special occasions with an elegant and dramatic look reminiscent of old Hollywood. The bracelet on the left has a sophisticated bead and button bracelet design with pink flower and silver heart buttons combined with pink crackle glass beads. The bracelet on the right is a one-of-a-kind bracelet with green fire polished czech beads and ornate gold buttons. Has your favorite jewelry seen better days? If you have jewelry that is tarnished you can clean it and have it looking like new in no time. Try gentle jewelry cleaning methods first, because cleaning methods that are harsh can damage the finish on some beads. To clean your tarnished jewelry, make a simple paste with baking soda and water. Gently rub the paste over the tarnished metal. Rinse then dry with a soft cloth. Your favorite jewelry pieces will sparkle like new again in a matter of minutes. In the future use anti-tarnish tabs and anti-tarnish bags for your cute earrings, charm bracelets and bold statement necklaces and you won’t be stuck home cleaning jewelry ever again, you’ll be wearing it out instead. Read my previous post on using anti-tarnish tabs and anti-tarnish bags. Mermaid Strand Necklace shown above has an elegant look with faceted czech glass beads and fashion buttons alternating on two strands and smaller faceted czech beads hanging from a third strand. Pretty strands twist in unique jewelry design making a beautiful impression. This dreamy twist style fashion accessory is designed for proms, parties, or any special occasion where you need added sophistication. Purple Diva Necklace shown above on the left has plunging double layers of eye catching buttons in divine shades of deep purple and dark blue and gives a bold edge to your style. Cool buttons are handpicked and hang in this pendant style drop on long silver loops. This fashion accessory brings fun adventure to any ensemble, so shine at that cocktail party and impress everyone with your new original look. Original Beaded Lucky Charm Necklace shown on the left has cute ladybug and dragonfly charms mingled with green and teal fire polished czech beads, then I added bright fun fashion buttons to complete the look. Every bead, button and charm is attached to a long elegant silver brass ring chain. This chic accessory has everything to make your style charming. Keep your jewelry looking like new using anti-tarnish bags or anti-tarnish tabs and protect your silver, sterling silver, brass, gold, silver plated, and gold plated jewelry pieces. I keep all my fun earrings, charm bracelets and handmade necklaces in anti-tarnish bags, or place anti-tarnish tabs in my jewelry box, because it saves me time and money. What causes your earrings, bracelets, necklaces and other fashion accessories to tarnish? The problem is gases rising from the metals combined with moisture in the air. This off gasing speeds up in direct light and with heat, so don’t leave your jewelry sitting on a windowsill, or a table in a sunny spot. All jewelry will tarnish a little over time and will benefit from some anti-tarnish measures. If you want to purchase anti-tarnish bags, read the directions thoroughly and make sure they have the special film to absorb the gases. Using just any ziplock bag won’t do, because they just keep the gases locked inside. Anti-tarnish bags should last 2 years and each anti-tarnish tab placed in your jewelry box will last 6 months. Store the spare tabs in an airtight container or ziplock bag. Next week I will be posting on how to clean your pretty beaded earrings, cute bracelets and all your pendant and statement style necklaces. Happy jewelry wearing! Flirty Charm Earrings shown above have silver pewter butterfly charms hanging over big green fashion buttons. These surprisingly lightweight drop dangles bring out your cool style with fun charms boldly highlighted in front of colorful fashion buttons. Hollywood Glam Flower Bracelet shown above has a glamorous vintage look perfect for fashion stars everywhere. This one-of-a-kind handmade jewelry piece mixes green fire polished czech beads and silver flower buttons for dramatic elegance reminiscent of old Hollywood. Refined Sweetheart Necklace shown on the left is made with bright green round beads and moss green rectangular beads. This flattering necklace's draping design will compliment any fashion style and works for all occasions, even as a chic bridal party necklace.